The new Legacy will land in a mid-sized sedan segment that has cooled considerably since expanding 22 percent in 2012. CHICAGO -- Subaru may be one of the hottest brands in the United States, but it has never made a major dent in the mid-sized sedan market. 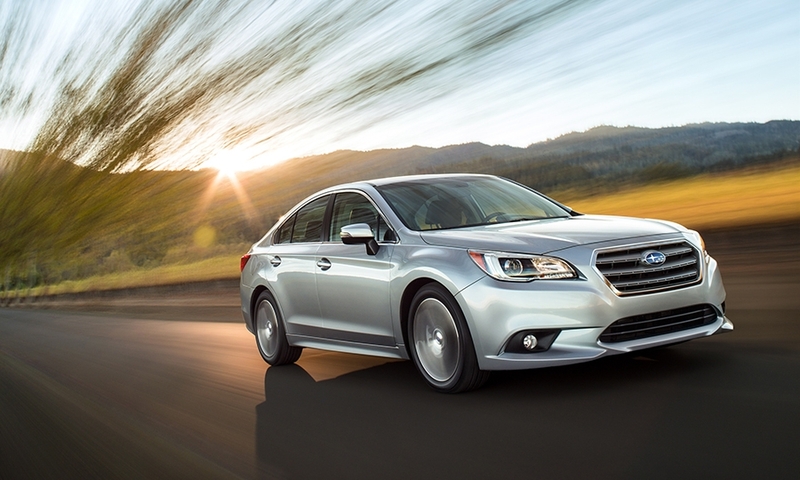 The all-wheel-drive specialist is out to change that by taking aim at its segment-topping rivals with a redesigned 2015 Legacy that boasts improved fuel economy and new safety, communications and entertainment features. The new Legacy's sportier, coupelike styling is geared to drawing more eyes and contemporary consumers to a nameplate that has generated annual U.S. sales of just 47,000 or less in recent years. That's a fraction of the volume routinely put up by rivals such as the Toyota Camry, Honda Accord, Ford Fusion and Nissan Altima. 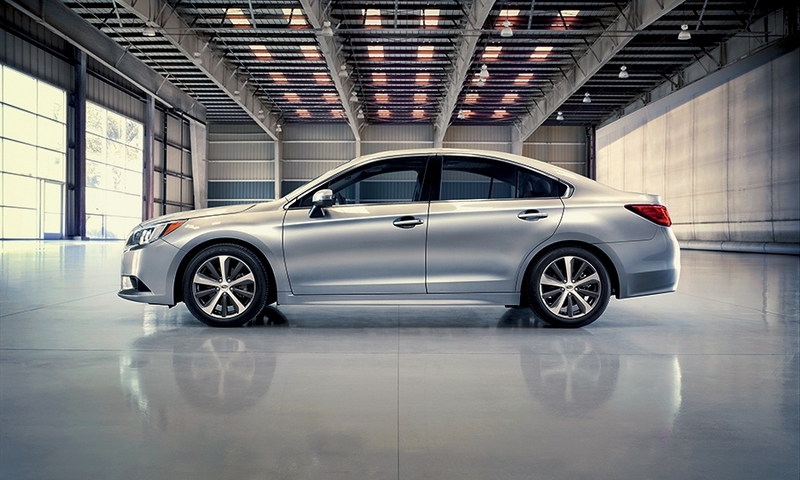 The fifth-generation Legacy debuted today at the Chicago Auto Show and goes on sale this summer in the United States. Subaru has not announced pricing for the Legacy, but the company has set the prices of recently redesigned vehicles below those of rivals. "Our crossover models are the mainstay of our growth, but we expect our sedan models to follow that trend in 2014 with the launch of the all-new Legacy, which will take that model into new territory," Bill Cyphers, senior vice president of U.S. sales for Subaru of America, said in a statement. Subaru is the only brand to generate six straight years of U.S. sales growth, including back to back gains of 26 percent in 2013 and 2012, with most of the growth coming from new or redesigned crossovers such as the Crosstrek XV and Forester. The new Legacy will land in a mid-sized sedan segment that has cooled considerably since expanding 22 percent in 2012. The giant, bread-and-butter family sedan market grew only 1 percent in 2013 and slumped 15 percent in January when overall car demand skidded 9 percent. Analysts attribute the mid-sized sedan segment's sluggish growth to the increasing popularity of small crossovers -- a Subaru hallmark -- that are roomier, sportier and more functional than sedans but still offer competitive fuel economy. Last year, the Legacy ranked 13th in sales among mid-sized sedans marketed in the United States, and it has been outsold regularly by its platform mate, the Outback wagon. Subaru of America President Tom Doll said today the company hopes to boost annual Legacy sales in the United States to about 60,000 units. Subaru of America plans to increase production of the 2015 Legacy sedan at its Lafayette, Ind., plant to achieve more balanced sales between the sedan and the better selling Outback wagon, Doll said. "We've got a little extra capacity," Doll said in an interview after the 2015 Legacy's introduction. Subaru hopes to increase production of the Legacy sedan to 60,000 units this year, he said. 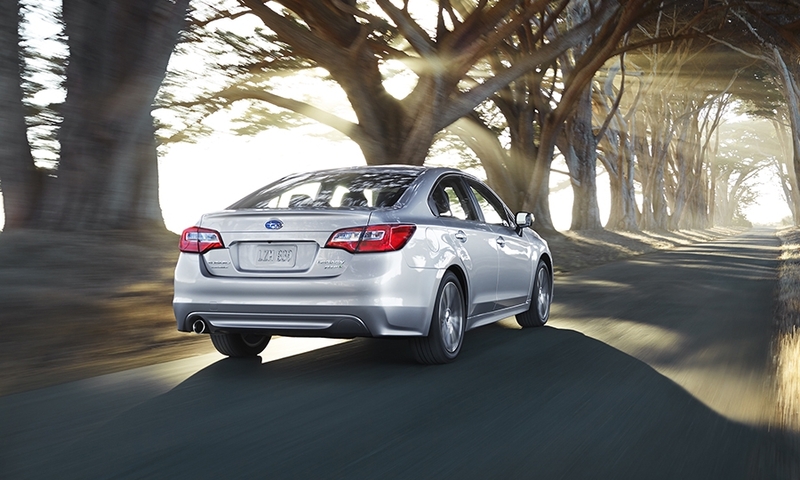 In 2013, Subaru produced 125,554 Outback wagons and 40,800 Legacy sedans in Lafayette. "We would like to close that gap," Doll added. Subaru says the Indiana plant has capacity to build 310,000 units, including a line that makes the Toyota Camry. Toyota Motor Corp., which partially owns Subaru parent Fuji Heavy Industries Ltd., made 97,000 Camrys at the Indiana plant last year. With the revamped Legacy, Subaru hopes to raise its profile as a competitor in the hot mid-sized sedan category, Doll said. Subaru has been known for many things in the past other than sedans. "We're the all-wheel drive company. We're the boxer engine company. We're a sports car company. We're the turbo sports car company. We produced the world's first sport utility wagon in the Outback, the father of the whole crossover segment," he said. "Today we are celebrating that we are also a sedan company. 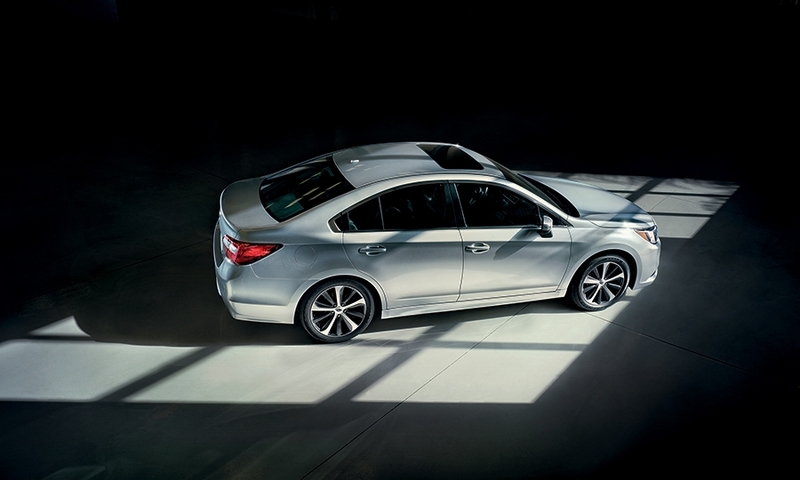 We're celebrating the 2015 Legacy sedan as a true player and the smart alternative in the mid-size sedan segment." Subaru boasts that even with standard all-wheel drive, the new Legacy has better combined fuel economy than the Camry, Fusion, Hyundai Sonata and Volkswagen Passat. Only the Altima's mpg rating is better, according to a Subaru spokesman. 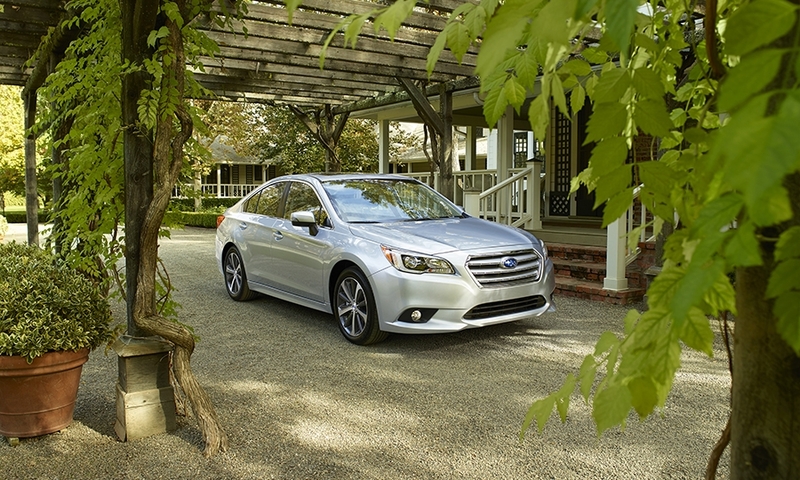 The base Legacy with a four-cylinder boxer engine has a fuel economy rating of 26 mpg city/36 highway/30 combined. One big reason: The base Legacy 2.5i will come with Subaru's active grille shutter system that reduces wind resistance when closed and improves fuel economy at highway speeds. The feature is being introduced, often as an option, on more-expensive vehicles such as the 2015 Ford F-150 pickup. Subaru's EyeSight driver-assist system, similar to those in some luxury cars, will be carried over and improved for the 2015 Legacy as an option. It integrates adaptive cruise control, precollision braking and lane departure warning. Subaru said the stereo camera-based system has received the highest ratings from the Insurance Institute for Highway Safety. 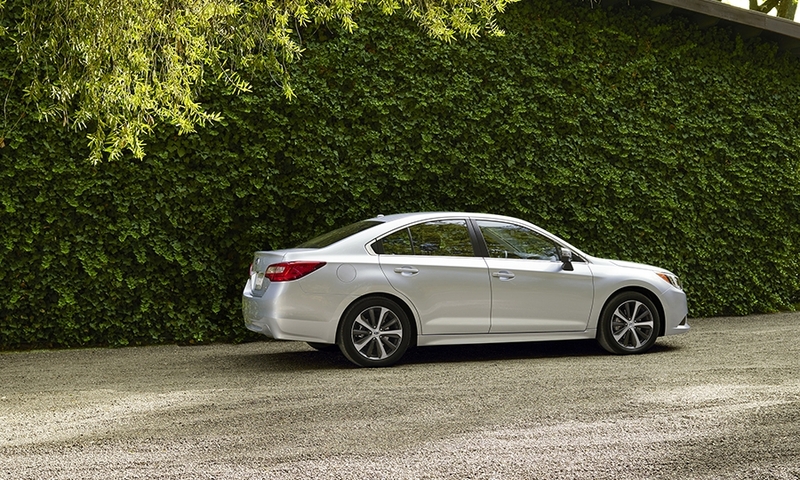 The 2015 Legacy is also "projected to achieve the IIHS Top Safety Pick+ award," the company says. While the 2015 Legacy has the same footprint as the current model, the windshield is more raked and aerodynamics have been improved 10 percent, helping drive gains in fuel economy further. The range-topping Legacy 3.6R has standard high-intensity discharge low-beam headlamps. All models have LED bulbs in the brake lights. 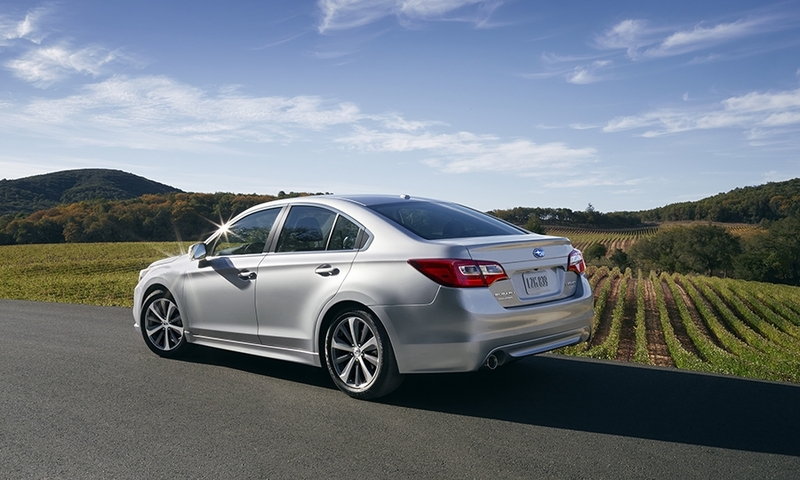 Subaru also has added or upgraded the Legacy's safety features. A rearview camera is standard. A rollover sensor can set off the side curtain airbags if it senses an imminent crash. A new optional rear radar system has blind spot detection, a lane change assist feature, and a rear cross traffic alert that determines whether vehicles reversing from parking spaces or driveways are too close. Subaru's Incline Start Assist and electronic Hill Holder also are standard. The new Legacy 2.5i has a four-cylinder boxer engine with 175 hp -- nearly the same as the current model. A six-cylinder boxer engine is available with 256 hp. All models come standard with a continuously variable transmission. The 2015 Legacy is quieter than the current model because of thicker panels and foam insulation in crucial areas, as well as liquid-filled engine mounts that minimize noise transfer from under the hood. Inside, Subaru said the Legacy has increased passenger and cargo room even though it has not grown in size. 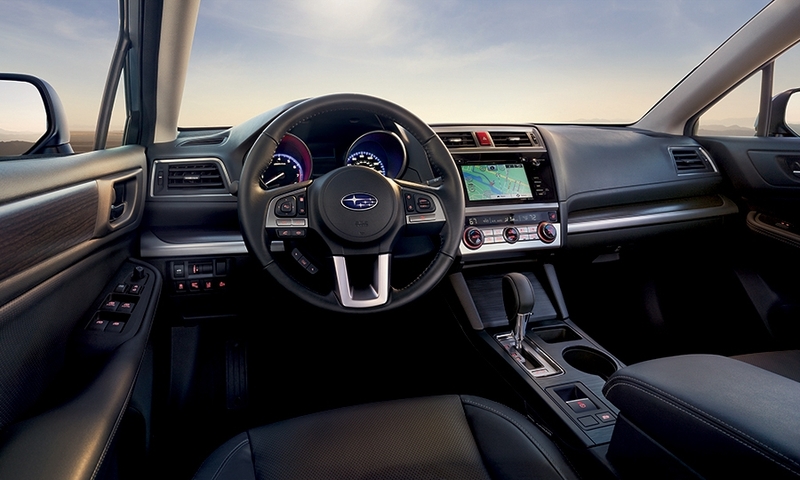 The instrument panel has been upgraded and the interior features soft-touch materials and thicker cushions for a more premium feel, Subaru said. Satellite radio is standard on all models except the base. The car has Bluetooth connectivity for phones and gadgets. The new audio system has a 6.2-inch touch screen. The optional navigation system uses a 7-inch touch screen. Subaru added a storage area in the center console large enough to hold an iPad and added a USB port as standard. A second USB port is optional.